Coming in seven different chromatic tones, this bag model gives you a lot of choices to express your personality and pick the model that best suits your usual outfits. The interlocked G adorning the bag will make a statement about the kind of fashionista you are, one with style and taste that knows when to invest and how to choose her most useful and best looking accessories. The light gold decorative elements come just to emphasize the statement made by this iconic bag. 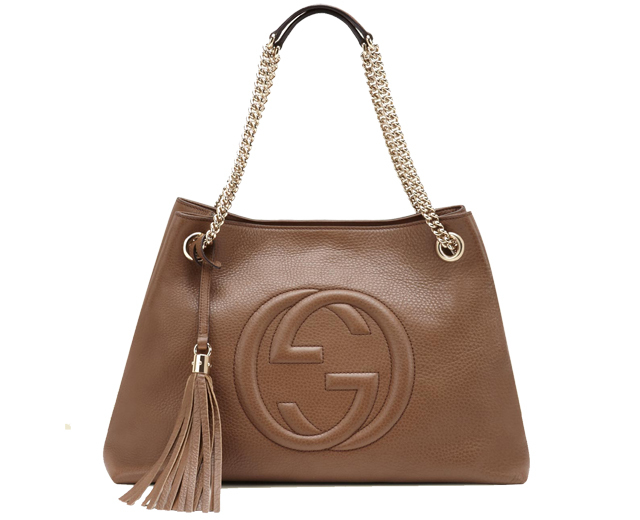 With Gucci Soho Leather Bag Â you will sparkle all day long and impress anyone around you. Once you put this bag on, you will never regret the decision to buy it. Inside this â€œmade in Italyâ€ bag, you will find a soft but very durable cotton lining that protects the bagâ€™s leather and makes your Gucci experience much more pleasant. Closing with a hook and equipped with interior zipper and pockets conceived especially for your mobile devices to fit in, this medium sized bag is everything you need as daily companion. The shoulder straps are double and they come also in a golden tone to underline your elegance and style.